Built-in Ethernet connectivity lets you print quickly from your network. Gigabit Ethernet 10/100/1000 ensures fast, reliable data speeds. Prints up to 50 pages per minute in black and white (manufacturer speed rating). Up to 1200 x 1200 maximum optimized black-and-white print resolution. Offers crisp, high-resolution printouts. 650-sheet total paper tray capacity. 100,000-sheet monthly volume is ideal for small-to medium-sized workgroups. Network security features help protect your data, so you can maintain a secure office environment. Fast print speeds, low cost per page and high reliability combined in the Dell B3460dn printer – an ideal mono printing solution for medium-size businesses. 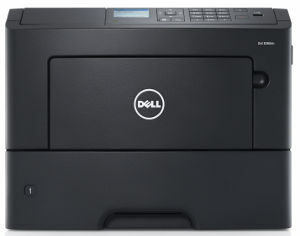 Get crisp and outstanding performance with the B3460dn Laser Printer from Dell™. With a maximum print resolution of up to 1200 x 1200 dpi, this printer provides high-quality printouts, high-speed printing and reliable performance. Get razor-sharp, professional quality prints at fast print speeds of up to 50 pages per minute (ppm) (letter) and first print-out time (FPOT) as fast as 6.5 seconds. The standard Gigabit Ethernet enables fast data transfers while the optional wireless card enables wireless printing and sharing. Reduce paper usage by up to 50% with automatic two-sided printing. With high duty cycle of up to 150,000 max pages per month, the Dell B3460dn is ideal for the high-volume printing demands of a medium sized business. Its powerful 800MHz dual-core processor and large 256 MB onboard memory processor enable fast data processing. This printer protects confidential information with Confidential Print, which requires a PIN for retrieval of printed sensitive documents. You can monitor, manage and create reports for all Dell printers on your network with the Dell OpenManage™ Printer Manager (OMPM) utility.